Was it Bitcoin that introduced Blockchain to the world or was it the other way round? Well, this fact is as debatable as the chicken vs egg. But nonetheless, both Bitcoin and Blockchain have done remarkably well this year. Bitcoin reached an all-time high of well above $7000. Blockchain attracted more than $2 billion investment. A handful of IT and banking pundits say that Blockchain is the real invention of Satoshi Nakamoto and not Bitcoin. It is so because the blockchain technology can be leveraged to solve many fundamental problems that our world faces in many areas. Since its invention, the blockchain that Bitcoin introduced to us has mutated into several other types of the blockchain. I have discussed some of the types of blockchain here on CoinSutra. But out of these aforementioned mentioned types of the blockchain, I am interested in two types i.e. Public Blockchain and Private Blockchain, because I feel they have a lot of potential. Because of this, anyone at any given point of time can join or leave/read/write/audit the public blockchain ecosystem and the network will still be trustless. Trustless here means you need not set-up a trusted party or entity to overlook the operations on this type of blockchain and yet it will be censorship resistance. The catch is that this type of self-governed, decentralized yet trustless autonomy is ensured on the system by its method of decision making which is very difficult or nearly impossible to tamper with. This decision making is called in this realm. On Bitcoin or Litecoin blockchain networks, anyone can do the following things that make it a truly public blockchain. —>Anyone can run BTC/LTC full node and start mining. —>Anyone can make transactions on BTC/LTC chain. —>Anyone can review/audit the blockchain in a Blockchain explorer. Private Blockchain is an absolute opposite of public blockchain. It is because many functions that are open to all on a public blockchain aren’t open here to all. Here one can’t read/write or audit the blockchain anytime unless one has the permission to do so. But it is not all that bad because in comparison to public blockchain it is much faster and cheaper because one doesn’t have to spend an enormous amount of energy, time and money to reach a consensus here. But in other sense, it is much less secure and closed as compared to public blockchain because it can be edited/written or read as when wished and deemed fit by the benefiting parties. —>Not everyone can run a full node and start mining. —>Not everyone can make transactions on the chain. —>Not everyone can review/audit the blockchain in a Blockchain explorer. In simpler words, to make any changes in such types of blockchains, one needs special privileges and accesses. These differences are good to identify the right type of blockchain for various use-cases that you might want to apply to but there are few similarities between both public & private blockchains that make it confusing for its users to make the right choice. 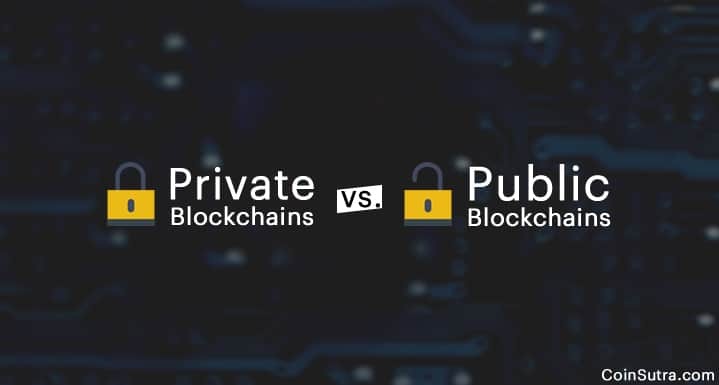 Hence, instead of getting carried away by these similarities let us always remember the above-elucidated differences between public and private blockchains. Also, in my opinion, despite these differences and similarities, public blockchains have the potential to disrupt many industries and revolutionize the world but it doesn’t mean that private blockchain will be useless. Private blockchain certainly has the potential to save millions of dollars for various industries by reducing many different types of behind the scene expenditures that can be automated in a trusted way through blockchain tech. That is all from my side in this article. It would be good to hear your thoughts on the blockchain, private chains and public chains in the comments section below.